Among the most divisive regional differences in the United States are dialect and vocabulary, revealing the outsider at the drop of a syllable. When addressing an individual (a “you”) in Pennsylvania, Pennsylvanians say “yins,” but in Georgia “y’all” is the common pronoun. If yins say “y’all” in Pennsylvania, the locals will note a couple of things: you’re not from the Keystone State, and you’re from the South. Not all language is so revealing, however. Some regional words are understood on a more national level and their origins aren’t obvious, like “futz” (to mess around) or “bear’s claw” (the pastry). Obscure words like “izzard” (Virginian for “the epitome of something”) will raise questions and eyebrows. “That frowy schnibble made me feest” may in fact make people think the speaker is from another country – or planet. This is where the Dictionary of American Regional English (DARE) comes in handy. DARE can alleviate any fears that one’s conversational partner is using fighting words, having a stroke, or speaking in tongues. Instead, the person you’re talking with might simply be expressing that she or he ate a bad piece of meat. DARE, a detailed account of U.S. colloquialisms, is a result of fieldwork and research nearly 50 years in the making. You won’t be able to carry it in your pocket, though – it consists of five large volumes, the last of which was published this year. In overseeing the creation of DARE, University of Madison-Wisconsin English professor Frank Cassidy took on an initiative that was long overdue. The American Dialect Society (ADS) had been haphazardly compiling lists of American sayings for years, but world conflicts and politics had prevented the ADS from going forward with publication of the material. In 1962, Cassidy began designing a 1,600-question evaluation to be given to individuals with curious speech from North to South, East to West. The fieldwork – interviews and audio recordings conducted with townies from 1,000 US communities – was completed by researchers and graduate assistants from 1965 and 1970. The next stage of work involved editing and analysis. For four decades, the DARE team diligently made sense of the words, their variant meanings, and their probable origins. The first edition (A-C) was released in 1985, with subsequent issues arriving in 1991(D-H), 1996 (I-O), 2002 (P-Sk), and 2012 (Sl-Z). In addition to definitions, entries include a map of the region where the word can be found, examples of how the word is used in specific areas within the region, cross-references to related terms, and approximate dates of its first usage. Blood, sweat, and tears aside, reading the dictionary may appear to be a fun exercise for language enthusiasts. But understanding dialects within a US region is as important as knowing another language when dealing with non-English speakers. A doctor in Appalachia would be well advised to distinguish “bealing” (an abscess or boil on the ear) from “runaround” (a swollen finger). The tomes carry a heavy price – between $85.00 and $125 for each volume from Harvard University Press – but the set is a useful tool for professionals of all fields of work whose jobs take them to different regions of the United States. If you’re curious before you buy, the volumes can likely be found at your local library. 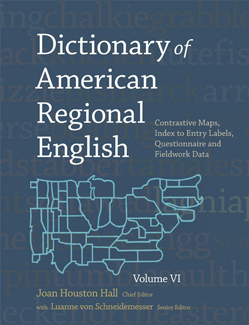 For more information about the Dictionary of American Regional English, and to see a sampling of their linguistic inventory, visit http://dare.wisc.edu/.